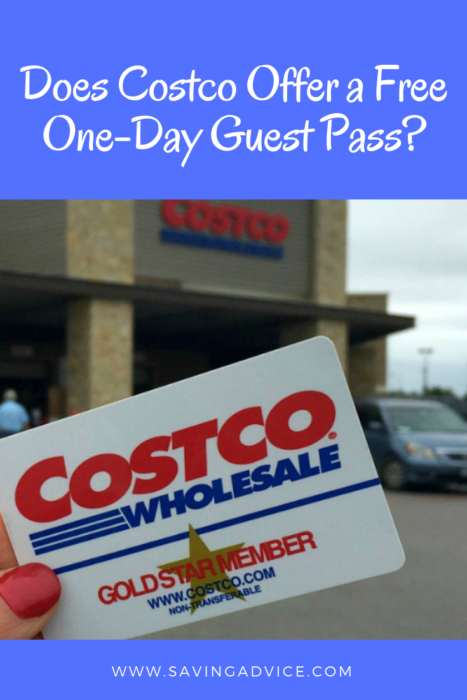 Does Costco Offer a Free One-Day Guest Pass? A lot of people wonder if there is a Costco free one-day guest pass to check out the store before purchasing a membership. The answer? No, Costco doesn’t offer guest passes to their warehouse stores, but that doesn’t mean you can’t go. Although Costco doesn’t offer a one-day guest pass, there’s a workaround that basically gives you the same opportunity to shop at Costco for one day. What you need to do is get a hold of a Costco gift card. If you have a Costco gift card, you can shop at their warehouses even if you don’t have a membership (these also work for purchasing gas at Costco gas stations, which is often the least expensive with the same gas quality as top tier gas stations. In this way, it works exactly like a guest pass. 1. Ask a friend who has a membership. Probably the easiest way to get one is to give a friend who has a membership at Costco the money and ask them to pick up a gift card the next time they go. The least expensive card is $25, but you can buy as much as you want at the store as long as you have a card with some money on it (you simply pay anything above the value of the gift card in cash). You could also request one as a gift for a special occasion (birthday, Christmas, etc). 2. Buy it on eBay or Amazon. Another way to get a gift card is to purchase it on a secondary market such as eBay or Amazon if you don’t have any friends with a membership, or simply don’t want to ask them to buy you one. Again, it doesn’t matter what amount is actually on the gift card (it could only be a few cents, and you’d still be OK), you just need one with money on it to shop at Costco. When entering Costco, you simply show the gift card and they will let you pass as if it were a membership card. At check out, tell the cashier you only have a gift card. The cashier will need to have a manager give a special code to accept it (there are always managers on the floor and it only takes a few seconds) and you will be good to go. If your items cost more than you have on the gift card, you will need to pay cash. Another way to shop without getting a gift card is to shop with a friend who has a membership. You can get inside the store with them, but they will have to pay for all the purchases you make. You can pay them back for your purchases once you leave the store. So while Costco doesn’t have an official one-day guest pass program, there are ways to shop at their warehouses without paying $60 for a membership. If you like this article, please leave us a comment, share it on social media or rank us five stars below. Thank you. I knew that Costco didn’t offer a guest pass because I called and asked, but I didn’t realize there was a way around it. Now I can go and check it out without buying a membership first. Exactly what I hoped to do. Good information to know. I have wanted to give cash cards to my friends in the past, but I wasn’t sure they would be able to use them since they didn’t have a membership. Now I can and know they can use them. I never knew you can buy it on ebay..
A couple of questions though. – I noticed that cards are usually sold at 15% mark up. Is it the profit or something else. It costs only $0.45 to post the card. – Whats up with the 5 cent cash value card? Just to get the entry and pay in cash? Yes, people sell them for above face value (although you can find them at face value from time to time) because it’s still less expensive than buying a membership. The 5 cent cards are sold as an entry into the store and yes, you pay for the purchases in cash in that event. Anyone here have a menbership and live in Toronto? Need one damn item from there. Warning this does not always work at all Costcos. I have tried it and more often than not the store manager will refuse to allow it. So you may wind up having to pay an extra percentage as a guest shopper or not using it. Even at the same store, I found one manager will allow it, the next day, another manager will not. If this has happened to you, contact corporate. The manager doesn’t know the store’s rules. The Costco site states anyone can use a cash card, even without a membership. They can get in trouble because if they do not allow you to use the gift card then they can get into trouble with Federal and some state laws. They have to let you use gift cards. It’s ridiculous Costco doesn’t offer a free pass for those who want to try it out. Even if you can do it with their cash card, it’s not easy for many people to get. You would think they would want us to try it and get our business. Apparently not. Wow, $400 a month I presently spend at BJ’s that I would love to have the opportunity to test out at Costco. It’s just not worth the $55 to learn if I prefer them to BJ’s and Sams. Definitely do a free pass and have a look around! You’ve got to try all three – especially if you’re spending $400/month there! Could make a difference. Buy the membership and shop. If you do not like it they will give you your money back. You can look around and see if you like the place and their prices. You just can’t buy anything. No. They are two completely different and competing companies. COCTCO sent em a Costco cash card in the mail as an apology for a poor service incident but then when I tried to use it the cashier said the card was empty :\ Then she took the card and threw it away. Now I need a cash card and not only did they lie about the content of the card, they took it away preventing me from putting more on it. Im not happy at all. I think a one day pass would be awesome for people who come from out of town and want to purchase items or browse the store.